This piece of furniture occupies the maximum amount of floor space. A comfortable sized bed can vary depending upon the requirements at the interior site. The patterns and decorations used on the linen also adds to the overall design theme of the bedroom. The headboard of the double bed (the part of the double bed which stands behind the head when we lie down on the bed) is a prominent feature and can be used effectively by using semi-circular shapes. A wardrobe is another element in a bedroom that creates a significant impact on the entire interior design theme. We always see a wardrobe in elevation. A typical wardrobe is most of the times measures 2100mm in height. The length and depth of the wardrobe differs from location to location. 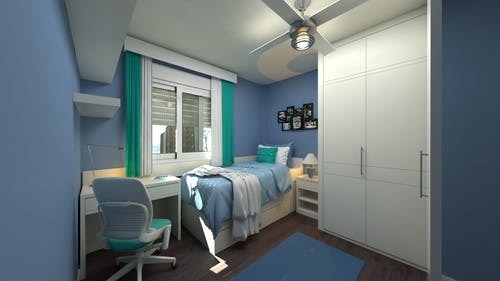 Depending upon the requirements a wardrobe might also include a small “money safe” with locking arrangements, drawers for keeping smaller sized clothes such as under garments. A wardrobe needs special spotlight arrangements to throw light spot on the person in front of the mirror. This will include a flat mirror and small storage spaces for the makeup-kits, perfumes, etc… In a case where the mirror is fixed on the outer surface of the wardrobe shutter,(as mentioned above) the storage space for make-up kit can be arranged inside the wardrobe. This combination of a study table and a book shelf is a great way to save space in small bedrooms. If the table top in not occupied by a computer or other objects, it can be made to fold This was a very basic study of the most commonly used furniture items in a bedroom. There are hundreds of creative ways to improve the performance and efficiency of furniture items in interior design. This article was just a starting point to trigger the creative genius in you.